The lives and adventures of Joey, Pebbles, Benji, Bruiser and Jax. We frequently get compliments on how good we look, and are often asked why we don’t have tear stains or discoloring around our muzzles! Some of it is genetics, but we also believe a major factor is due to our diet. A year and a half ago, we wrote a blog post about how we make our own dog food using grass-fed & free-range meats along with organic vegetables. We continue to learn more and more about healthy ways to feed our pack and felt that it was time for an update. Not a lot has changed, but we like to make sure that the info we share is as up to date as possible! To learn more, read on, then visit Raw Paws Pet Food and use code PBJPACK15 to save 15% on your order! (Note: The links in this article are affiliate links and we make a small percentage of any sales resulting in orders from these links). Not only do we love our food and meal time, but we are four healthy, little fluffies! Our blood work results always comes back right in range, and our visits to see our favorite vet, Dr. Kelly, are usually just for routine checkups, making sure everything is still on track. Whatever you choose to eat, we do believe 100% in feeding real food…appropriate for the species, of course. We eat a mixture of protein meat, organs, bones and veggies. We currently eat raw, but in the past, we have also cooked our meat and veggies. Do what you’re most comfortable with…as long as it’s real food, you can’t go wrong! Please Note: We never, ever eat cooked bones. Cooked bones can splinter inside the digestive system and create really bad problems. If you’re going to eat bones, make sure they are raw! Bones like duck or chicken neck and chicken feet are a great weekly treat. Chewing on them can help keep our teeth in excellent condition by knocking off any tarter buildup. We buy all our bones from Raw Paws Pet Food or U.S. Wellness Meats. 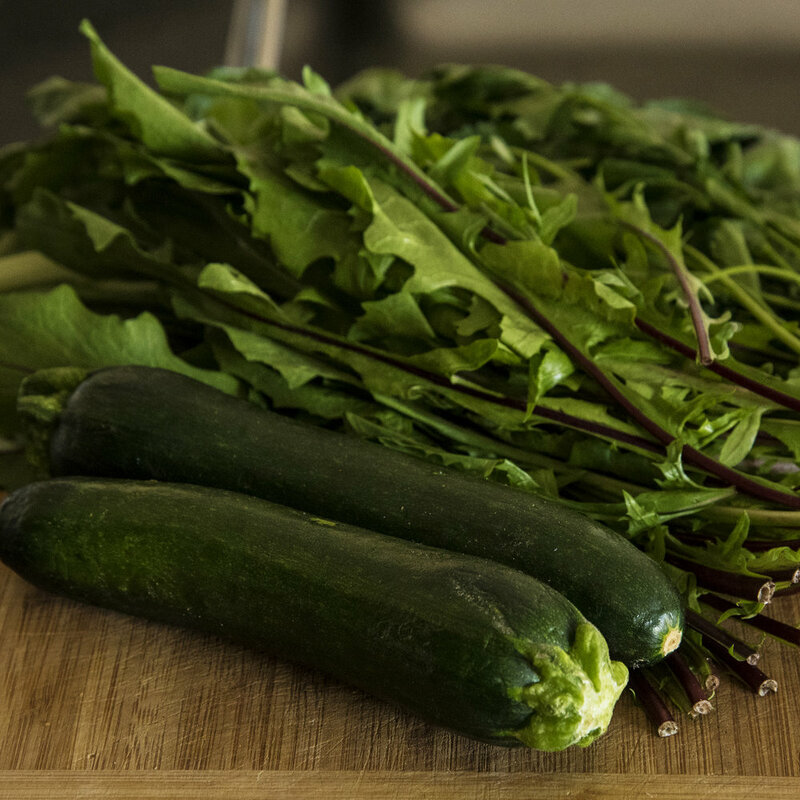 Pick up organic greens and veggies from your local grocery store. 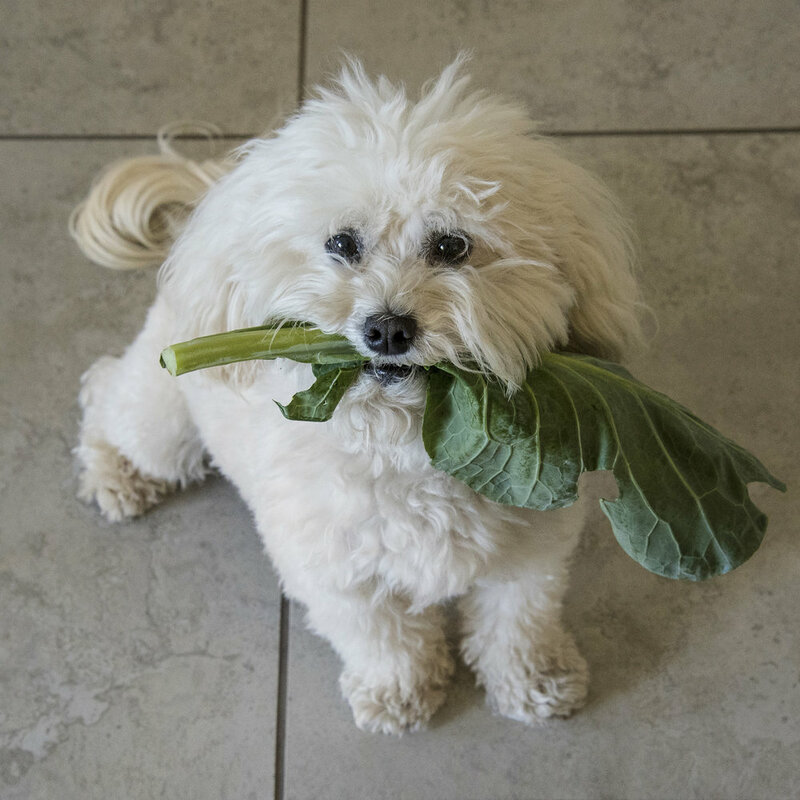 Carrots ("Are Carrots Good for your Dog") because they can be harder to digest, and can create bloating & gas. Place all of these veggie ingredients in your food processor and puree. You’ll probably want to do it a few handfuls at a time. Before you place all the ingredients in the food processor, be sure to look down. There’s probably a pup, or two, or four, who would like to help taste test. (Food making day happens every couple of weeks at our place…and it is definitely our favorite day of the week! For your meat, we have two excellent sources for you! We were recently introduced to Raw Paws Pet Food. We love that their meat mixtures come with ground bone and organ, in addition to the protein. And, they have a good variety, including Goat, Beef, Lamb, Mackeral and Chicken...all grass fed, wild caught or pasture raised! Mommy always likes to mix it up, so that we’re constantly getting different protein sources…not only to provide us different nutrients, but to also give us variety in our diet. We even tried their meat without any veggies mixed in and it was absolutely delicious! If you are going to cook your food, you would not want to buy meat that has bone mixed in. US Wellness Meats is another great place to get high quality, grass fed, or pasture raised meat. They have a wide variety of proteins, including Chicken, Turkey, Duck, Bison, Beef & Lamb. They even have a Pet Burger meat that has organ mixed in...it’s one of our favorites! You’ll need 2 lbs. of meat to mix with your pureed veggies. Don’t mix proteins in a given batch. It’s best to keep both pounds the same. Combine your pureed veggies with your ground meat in a large bowl. Scoop 1/4 cup sized portions into muffin tins. Place muffin tins in the freezer, until nuggets are frozen. Once frozen, take out and store the nuggets in a zip lock bag in the freezer. We take the nuggets out of the freezer the night before and let them thaw overnight in the fridge, so that they’re ready to eat the next morning. If you want to eat cooked food, this would be the time that you would fill a saucepan with about a 1/2 inch of water and add the nuggets. Heat until they break apart and are cooked through. Once a day, you can cook up the number of nuggets that are needed for the day, divvy them up and store them in the fridge. We eat 2-3 nuggets a day (FYI...we weigh between 7 & 9 lbs. ), depending on our activity level for the day. We eat two meals a day, dividing our nuggets into half servings. Now it’s time to chow down!! Make sure you lick the bowl completely clean...don’t leave any of that precious goodness behind. A lot of what we have learned about healthy eating has come from Dr. Dobias. He and his team are committed to helping us dogs live longer, healthier lives! His website is full of free information. You can either start with his Health & Longevity Healing Course, or use the search function to find exactly what you are looking for.